This is a Dennis DF Command Support Unit belonging to Cleveland County. Cleveland are unusual in that the front of their appliances are painted white. Until recent times their appliances were still fitted with bells as well as the standard two tone horns. The bells were considered to be more acceptable for use in the country villages which make up a large proportion of the county. 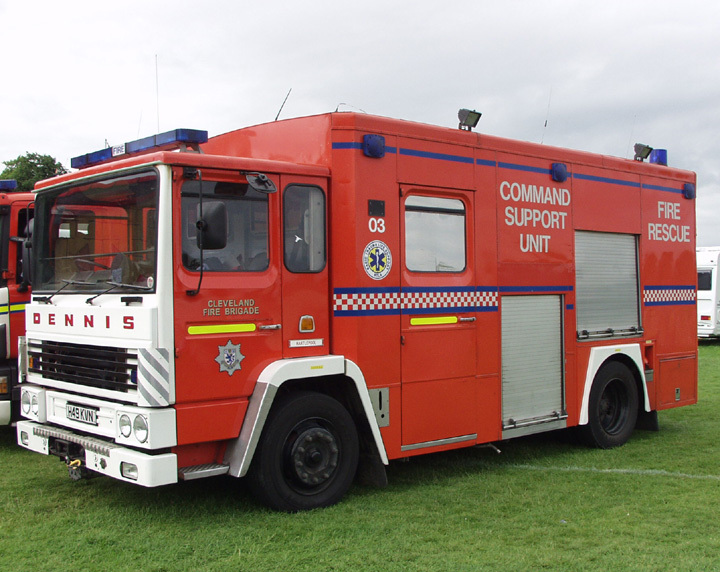 This machine new in 1990, was the result of a project by the Brigade and Teesside University, in its original format it was an Emergency Tender with an extendable body, however this wasn't that successfull, and the machine was converted at the Brigade workshops in Thornaby to the format seen here. it comprises the functions of ET and CU on the same vehicle, and is based at Stranton in Hartlepool.The Machine is in a rather unusual light vermillion rather than red, this came about as a result of Cleveland County's directive that all council owned vehicles should be the same colour!The white fronts on Cleveland Machines originated in 1971, when after a visit to New York, the CFO decided to apply white fronts to the appliances in order to make them more visible under orange street lighting. there had been visibility problems nationaly with the introduction of orange street lighting, and several brigades experimented with differnt colour variations, Clevelands appliances were going to be Dayglow Yellow!! however thankfully, this rather tastefull addition to the livery was introduced instead. The white fronts were first applied to a pair of AEC's (AXG2/29K) which were new in 1971 to the newly built Billingham fire station on Seaton Carew road, the practice continues today. This machine has recently recieved a refurbishment and it is now a very elegant dark red. Added by Chris Hall, Teesside. on 10 November 2007. Hi Chris! The F&Rs Borås, (provins Västra Götaland), had the same problem with the RED vehicles! They was unseen unders the orange streetlights, if the blue lights was off!They was repainted in Yellow, and voi la, they become visible wihtout the blue lights! Added by Anders Fallström on 31 October 2014.